What color would you suggest for an accent wall? Sounds like you have a really strong, warm color scheme there. Quite often an accent wall is used when a room is a little too neutral or simply lacking something and needs an injection of color to make it come alive. 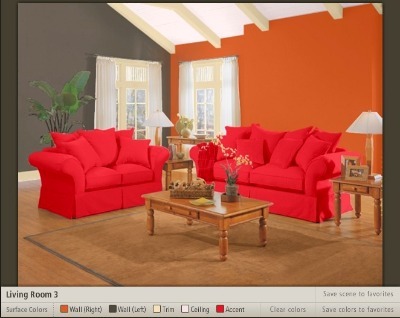 I don't have a picture of your room but used your colors in the Sherwin-Williams Color Visualizer to get an idea of how it would look and I think you have two good options here depending on your answer to the above question. If you want to make the color scheme even stronger or more dramatic you could opt for black. Not to everyone's taste but it can look really stunning and quite elegant and you already have a little black in your pillows. If you feel that your room has too much color or is perhaps too intense or maybe dark then a warm neutral color may be worth thinking about. Does your local DIY store have a paint mixer? To get the right shade to look good with your tan, you need to add some of the tan paint to white which will ensure that you get a good co-ordinating color. Just add as much or as little tan as you like to get the shade you are happy with. Comments for What Color Should I Use To Paint An Accent Wall? Thank u so much for the ideas!!! !